In Firefox on Linux Mint, Google is not in the default list of search engines. 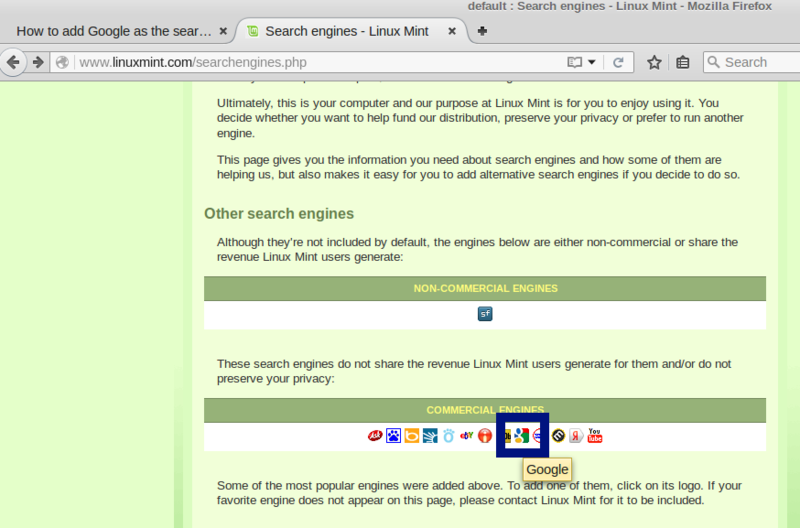 Linux Mint has its criteria for adding search engines while Google seems not in those suggested by Linux Mint because “Amongst commercial search engines, only the ones which share with Linux Mint the revenue Linux Mint users generate for them are included by default” while Google seems not share revenue with Linux Mint. Linux Mint states “eventually all search engines will share the revenue our users generate for them and be included by default in Linux Mint” while it is not true yet. Google is the choice of many Linux users and Linux Mint does not block Google in its distributions of the Firefox. How to add Google in Firefox on Linux Mint is introduced in this post. First, in Firefox, visit Linux Mint Search Engines page. Second, find the tiny Google icon and click the link. Last, in the search toolbar of Firefox, you will see a small green “+” icon. Click the icon, click “Add Google”, and then you can add Google to your search engine list in Firefox now. 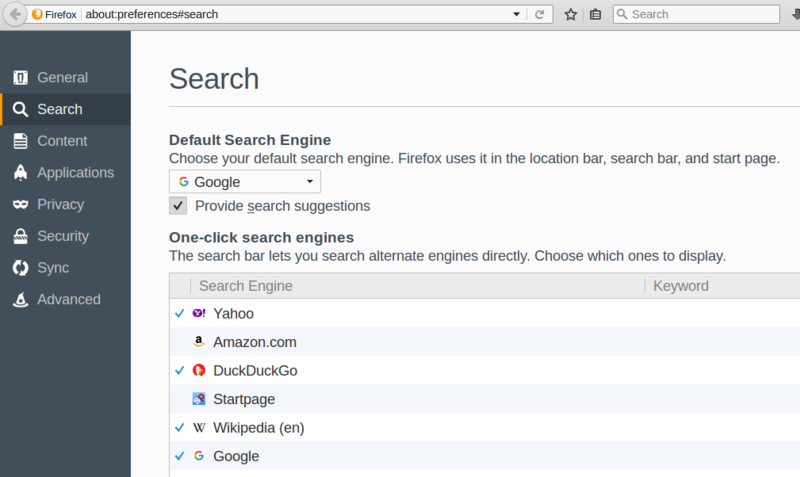 You may choose Google as the default search engine too in Firefox by opening the following page in Firefox. Now, Google is back for you in Firefox on Linux Mint. Cheers! The Linux Mint website is offline. In response, and while it was trying to get a proper handle on its vulnerabilities, the Linux Mint team wisely took linuxmint.com offline. I can understand why the commercial engines are left out and I have no problem using startpage and will gladly do so but the way that Mint obscures the possibility to add other search engines is not cool. All they had to say was to please consider using search engines support us and these search engines protect your privacy. I’m totally on board with that. But giving me a modified version of Firefox and making me have to hunt down the way to add those others is something I would expect out of Microshaft.